When she drowsily woke up, she suddenly felt that her blanket was moving. When she opened her eyes, she saw a black shadow quietly floating near her bed. She shouted, "Where did this demon come from?!" Then she turned over and pushed the black shadow away, "Evil sprit retreat and scatter! Great Vajra Palm! Ma mi ma mi hong!" Unexpectedly, the black shadow retreated half a step back from the bed. The black shadow even started to tremble without stopping as if it was doing its best to resist doing something. Qing Qiao quickly hid herself in innermost part of the bed. Then, she firmly pulled the blanket to wrap around herself until only a pair of round eyes was left outside to look around. The entire set of actions was quickly and smoothly done without any hesitation. It really made a person want to sigh in admiration. "Are you... a person or a ghost? I'm... I'm warning you. Don't kill me!" Qing Qiao stared at the black shadow. While she trembled, she still threatened it with power, "... I won't hide the truth from you. There's someone above me!" Qing Qiao's face collapsed. She looked like she was about to cry. "Hero, please spare me! This subordinate still needs to sleep!" Neither quickly nor impatiently, the black shadow lit a lamp before leisurely sitting down at the nearby table. He was smiling as he observed her carefully. "Come here. Tell older brother, who's above you?" "Lu Zi Zheng!" Qing Qiao gritted her teeth, pursed her lips, and prepared to have a falling out, "This old mother didn't even eat enough at dinner. Now, you won't even let me have a peaceful night of sleep?!" Lu Zi Zheng narrowed his peach blossom eyes before knocking on the table. "I knew you would be gluttonous. Come out to see what older brother has brought you." Qing Qiao curiously extended her head to look. She couldn't help screaming in excitement, "Aiya! 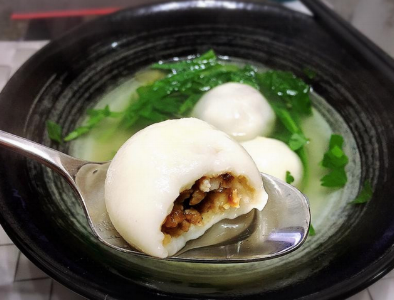 Glutinous rice dumplings!" "And they're even filled with meat." Lu Zi Zheng glanced at her. Looking rather proud, he said, "They just came out of the pan and they're still hot. Do you want them?" "I want!" Qing Qiao hurriedly nodded. Then, she stared at him with an incomparably affectionate and nauseating expression. "Zi Zheng, you're really my... good friend*!" "Friend?" Lu Zi Zheng looked at her harshly and unreasonably for a moment before smiling speciously at her. "If you really think of me as a friend, how much do you trust my words?" "This... I'll believe three out five sentences at least..." Qing Qiao wiped away her sweat. Her gaze was oddly erratic. "Three sentences?" Lu Zi Zheng raised an eyebrow and sneered, "You treat your "friend" surpassingly well." Qing Qiao hurriedly lowered her head and acted bashful, "If you want to hear lies, I'm willing to change three to five..."
The temperature in the room suddenly dropped to negative Celsius degrees. In the silent room, they heard a black crow slowly flying by while cackling. After looking at her for a long time, Lu Zi Zheng quietly said, "... Open your mouth." Qing Qiao timidly raised her head. She bit her lower lip and pitifully looked at him. "I want you to open your mouth!" He was slightly impatient. "Don't! Won't it be okay if I change three to six? How about I change it to eight?" Scared, Qing Qiao's small face was so crumpled that it looked as if she was going to start crying. "Don't feed me poison. Even though my background supporter is formidable, it doesn't include a miraculous godly doctor that can cure poison at the moment..."
Lu Zi Zheng didn't listen to her words. He turned around and brought a spoon filled with something towards her mouth. Eh?! Stunned, Qing Qiao looked at the plump white substance in front of her. It was a glutinous rice ball. She felt as if there was a small stream in her brain that was boldly babbling and flowing out. She hadn't felt this way for a long time. "... Are ... Are you feeling feverish?" She discreetly asked, "Did you take medicine?" One must surrender to tyrannical abuse. Qing Qiao closed her mouth and mechanically chewed. As she chewed, her eyes widened until they became as big as copper bells. She ate one glutinous rice ball, then another one, and another one after that. The demonic Lu Zi Zheng sat by her bed and "fed" her a total of ten glutinous rice balls. After feeding her the last one, the demon finally remembered to show concern about her reaction and asked, “Do they taste good? Qing Qiao shook her head, then she nodded. Her head was completely blank. She completely didn't understand what had just happened. "You don't have to be so nervous." Lu Zi Zheng warmly smiled. He patted her shoulder and comfortingly said, "I just suddenly wanted to experience the feeling of serving someone." Ah, so it was like that? With her cheeks still full of glutinous rice, Qing Qiao started the most inarticulate interview in all of history. "Then, how do you currently feel?" Lu Zi Zheng raised his chin and looked at the distant moon through the window. He thoughtfully said, ""I feel... There are some things in life... It's not too bad to occasionally experience doing them."